I live on Kauai and love exploring all the great off road trails here. One of my favorite is the trail at the end of Kuamoo Rd at the base of Mt waialeale. It's approx.4 miles long starting at the water crossing over the road. This is where they filmed parts of Jurassic park. Looking to spend some time in the next few months exploring Waimea. There are a crazy amount of trails up there. Please chime in if you are or have in the past found great trails om Kauai. Ahh Loop Road is fun. I got some fun memories up there. But the west side of the island has alot of trails. I never been but the Kalaheo "filter road" i believe it's called is pretty challenging. I think it also goes by Kalaheo dam. My brother showed me this short but challenging trail in Anahola. That will definitely give your suspension a workout. On Kauai monthly from Oahu... Looking for some off road adventures and talk story about Jeeping... Can do? I like the trail that begins at the end of Kuamoo Rd. in Wailua on the East side of the island. When do you leave the island? I'm off this tuesday but i have to spend some maintenance time on my jeep. So maybe next week when i get two days off can talk story. Will try again next month... Do you live on Kauai? Stuck my jeep this afternoon. Combination of the wet and slick tires. Anybody up to give me a quick tug. Up in the princeville area. Case of beer for the help. Going to be moving to Kauai next month. Definately long for some talks near Waimea. Just got a 2013 Wrangler and new to offroading. 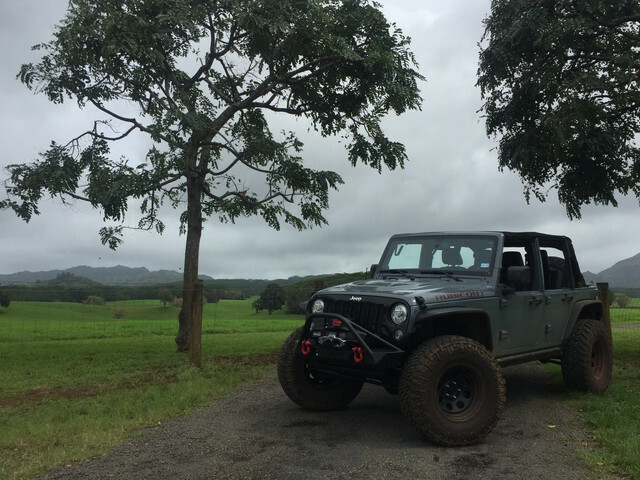 NeWere4x4 is checking out Kauai's trails late January to early February 2015. If you are in the area and want to join in, let us know! We have not been there before, so any tips are appreciated! I'm guessing due to weather, the east trails are a better choice? NeWere4x4 - still in Kauai? Just got here and anxious to check out some trails. In a rental JK so the tires are probably going to be the biggest limiting factor. Heading out to Kauai for some family time. Shipping my jeep over from Oahu. Anyone wanna show us around would be great. Spending most of my time at polihale, and Waimea. Would love to check out sleeping giant and powerline trail. Anyone up for it? If you do check out the Powerline Trail do not go alone. That trail is pretty rough and will definitely give your suspension a work out. A lot of people tend to "dig" the place up so some areas will be pretty deep. I'm bringing this thread back! Let's go off-roading guys! I live in Lihue. I live on the south side and am down to go offroad some time.